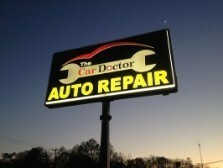 Routine car maintenance is mandatory in order to keep a car running properly. The following guidelines are the approximate intervals many car manufacturers suggest auto maintenance service be performed. However, always refer to the owner's manual, dealer or authorized service professional for the particular service and intervals required. The oil and oil filter should be replaced according to the manufacturer's recommended auto maintenance schedule with a majority suggesting the oil and oil filter be replaced between 3,000 and 7,000 miles. Furthermore, inspection of the transmission fluid level, coolant, power steering fluid, windshield washer fluid and wipers, tires and all exterior lights is also encouraged. Replace the air filter every 15,000 miles. Every 20,000 miles inspect the battery and coolant. Most 25,000-mile maintenance service requires replacing the fuel filter. Every 30,000 miles, replace the air filter and power steering fluid. Inspect the coolant, radiator hoses, HVAC system, brake pads and all suspension components. Oil changes and air filters are very important parts of engine maintenance; however, a thorough inspection of all engine, transmission, cooling, brakes and suspension components should also be performed regularly. The owner's manual provides a routine auto maintenance schedule based on engine mileage for most cars.